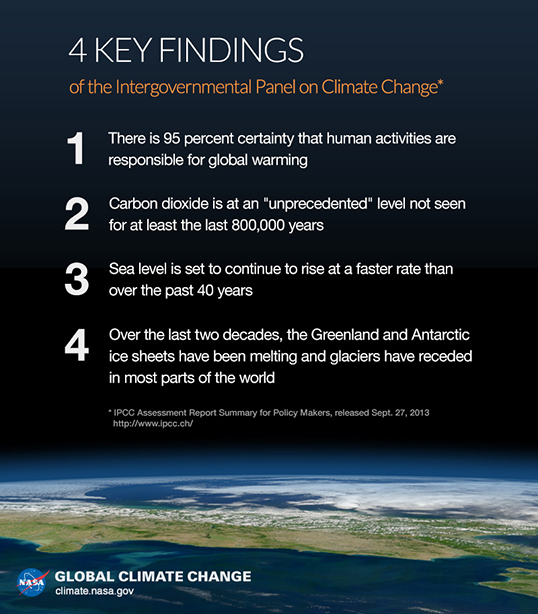 The graphic below lists four highlights from the Intergovernmental Panel on Climate Change's (IPCC) Fifth Assessment Report Summary for Policy Makers, released September 27, 2013, which more than 25 NASA scientists helped to author and review. According to the IPCC Fifth Assessment Report, global warming is "virtually certain" (probability >99%). Observation systems, particularly those based on satellite measurements, have increased the number of studies on the Earth's climate system. In particular atmospheric observations show that, from 1880 to 2012, the average global temperature is increased about 0.85° C, the first decade of the 21st century has been the hottest since 1850 and that the period from 1983 to 2012 was the warmest of the last 1400 years. Observations show also a significant ocean warming in the early 700m deep that extends up to 2000 m. In the period between 1901 and 2010 the sea level has risen (about 19 cm) and it is the highest increase in the last 2000 years. Ice observations show that the glaciers are shrinking across the planet. The total Terrestrial ice mass is estimated 30,000,000 Gt and, from 1971 to 2009, the mass of glaciers has decreased at a rate of 226 Gt/year. From 2002 to 2011, the ice mass of Greenland and of the Antarctic decreased, respectively, at a rate of 215 and 147 Gt/year. From 1979 to 2012, the Arctic sea ice diminished at a rate of 3.5% to 4.1% every ten years. Since 1750 the concentrations of CO2 and other greenhouse gases have increased reaching the highest values of the last 800,000 years. To give an idea, the concentrations of CO2, CH4 and N2O, have increased, respectively, by 40% , 150% and 20%. Several simulations of global temperature trends show that global warming is inconsistent with only natural factors. It is, however, consistent with simulations that include natural and anthropic factors. The probability that human activities are responsible for more than 50% of the increase in temperature between 1951 and 2010 is estimated to be greater than the 95%.